This article begins our series on Daoist Meditation as it is practiced in the internal martial arts. It answers the crucial question one should ask before practicing meditation – why meditate at all? Starting this month, we offer IAI members nine lessons on Daoist Meditation, meant to be practiced over nine months. By practicing one lesson a month, for nine months, members can get a solid grasp of the principles of Daoist meditation as well as a variety of tools that relax, integrate and regenerate the body, mind and spirit. This article is accompanied by an introduction to the nine lessons found in the members section. The first lesson begins this month. Why meditate at all? Does this “navel gazing” have a functional purpose? What does meditation actually do, and why has this withdrawal into the interior for centuries been a cornerstone of Eastern mysticism? To understand meditation, and particularly Daoist meditation, we must look at the meaning of the Dao itself. 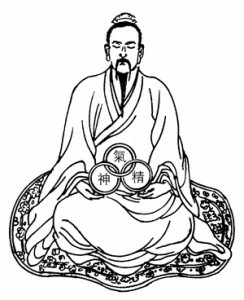 Lao Zi’s classic text, the Dao De Jing, literally means “the classic of the virtue of the Dao”. 彳 Footstep (chi) and Straight 直 (zhi). De is usually translated as virtue; morality; ethics. Jing here means a cannon or scripture, but Jing originally meant a warp in a loom. Heaven abides so that we have virtue [potential]. Earth abides so that we have Qi/Breath. When virtue [potential] flows and Qi/Breath is blended, there is life . The crossing of Heaven and Earth is life (Sheng). The ideogram for Sheng (life; growth; to engender; birth) is a picture of a growing plant pushing up through the layers of the earth. It should be mentioned that Heaven here is a natural operating system, organic and all-encompassing, that governs and abides in all things. It is important to remember that virtue, in this context, includes but is not equivalent to morality and ethics. The term also implies an effective force or power, an efficacy or potency. Earth carries and receives Heaven’s virtue and embodies it in form. Heaven can only be spoken of as a compliment to Earth, and only observed through its interpenetration with Earth’s Qi/Breaths its ever-evolving forms. Through Earth’s Qi/Breaths, Heaven’s creative spark, its virtue, is observable. Earth in me, is the presence of diversity, of varied and multiple aspects, under the authority of the celestial unity that forges a being. It is also the ceaseless transformations. The breaths extend everywhere; they occupy available space without encumbering it; they are light and fluid, which permits their junction and co-penetrations and also their rising to meet Heaven. The breaths of Earth are not imprisoned, all they ask is to intersect each other under the impulse of Heaven. Thus all that is breaths in me is Earth, breaths projected toward the one Heaven, For Heaven makes these breaths those of one particular being, with its own destiny and nature. In Daoist thought, human life is a manifestation of the all-encompassing respiration of Heaven and Earth, the yin and yang flux that flows between them. Therefore, life for human beings in the natural world is expressed through movement and change. The Qi/Breath flows and circulates everywhere; it flows through the body as it would through a landscape or a painting. The body is a living landscape in which the forces of Heaven and Earth are always present, always operating. Life is a result of concentration of the Qi/Breath and death is its dissolution. Thus it is said that what courses through the entire world and causes it to communicate is the unitary breath, yi qi (literally: the “One Qi”). Through this breath-energy, I am connected to the primordial current, the generous progenitor from which life stems directly and permanently. That is why “wisdom” consists “solely” in returning to the primordial flow…. This re-incites my life. More succinctly put, wisdom is a matter of freeing myself from all internal obstructions and focalizations in order to recover the communicative aptitude of the qi that produces me. This qi can neither mature nor stagnate but must be kept alert. One day Hassan, a Sufi mystic, went to Rabiya, the great Sufi woman. He had just learned how to walk on water, so he told Rabiya, “Let us go and walk on water and have a little spiritual discourse, discussion.” That spiritual discussion was just an excuse; he wanted to show Rabiya that he could walk on the water. Rabiya said, “On the water? That does not appeal to me. Let us go to the clouds! We will sit on the clouds and have spiritual discourse.” Hassan said, “But I don’t know how to go to the clouds and sit on the clouds.” Rabiya said, “Neither do I! But what is the point? Why can’t we have a religious discourse here? Why go to the water or to the clouds?” All great mystics have been against miracles, and all fools are interested in miracles. In Daoism and Daoist meditation, life and death are merely points of change within an ongoing cycle of change. Neither is privileged. Both are equally valid or real, just as all phases of cyclical change are equally valid and real. There is no heroic defiance of death or ecstatic celebration of life, but instead an ongoing experience of change and transformation of which of life and death are but a part. In this context, meditation becomes a tool to connect with that change and transformation. Meditation as a life-nourishing practice is something that must be done slowly and constantly. Like nurturing a delicate growing plant, it is a series of small steps performed carefully, and at the right time. We want to move quickly, we want to see progress, but like the farmer in the Chinese fable who pulled on rice shoots to help them grow more quickly only to succeed in killing the plants, excessive enthusiasm can cause great harm. Instead adopt a natural attitude, like a small boat without paddles or sail, that leisurely follows the course of a meandering stream. Things evolve slowly. Change occurs constantly but manifests slowly. It is our ongoing engagement with the process without seeking immediate results that actually produces the results. Therefore, take a bold resolution and start to train seriously. As from today you should dwell in singleness of thought; your eyes and ears should disengage from objects; regulate your diet; reduce your sleep; refrain from futile talk and jokes; stop thinking and worrying; cast away soft comfort and cease to discriminate between the handsome and the ugly so that you can be like the cicada feeding on dew to preserve its unsullied body and like the tortoise absorbing the vitality from sunlight to enjoy long life. The Way and Its Power, A Study of the Tao Te Ching and its Place in Chinese Thought, by Arthur Waley. New York: Grove Press Inc., 1958, pp. 31-2. A Short History of Chinese Philosophy: A Systemic Account of Chinese Thought From Its Origins to the Present Day, by Fung Yu-Lan. New York; London: The Free Press, 1948 and 1976, p. 105. Rooted in Spirit: The Heart of Chinese Medicine, translation and commentary by Claude Larre, S.J & Elisabeth Rochat de la Vallee. Barrytown, NY: Station Hill Press Inc., 1995. Ling Shu or The Spiritual Pivot, translated by Wu Jing-Nuan. Washington DC: The Taoist Center, Distributed by University of Hawai’i Press, 1993, p. 39. Daoism Explained: From the Dream of the Butterfly to the Fishnet Allegory, by Hans-Georg Moeller, Chicago and La Salle Illinois: Open Court Publishing, 2006, p.76. Vital Nourishment: Departing From Happiness by Francois Jullien, translated by Arthur Goldhammer. New York: Zone Books, 2007, p. 76. Li and Qi in the Yijing by by Chung-ying Cheng in Philosophy of the Yi 易：Unity and Dialectics. Supplement to Volume 36 2009 of the Journal of Chinese Philosophy, edited by Chung-ying Cheng and On-cho Ng. Blackwell Publishing – John Wiley and Sons 2009, p. 92-3. A Short History of Chinese Philosophy: A systemic Account of Chinese Thought From Its Origins to the Present Day, by Fung Yu-Lan. New York; London: The Free Press, 1948 and 1976, p.25. Daoism Explained: From the Dream of the Butterfly to the Fishnet Allegory, by Hans-Georg Moeller, Chicago and La Salle Illinois: Open Court Publishing, 2006, p. 83.
 . The Secrets of Chinese Meditation by Lu K’uan Yu (Charles Luk), Maine: Samuel Weiser Inc. 1969, p. 170. Taoist Yoga: Alchemy and Immortality by Lu K’uan Yu (Charles Luk), Maine: Samuel Weiser Inc., 1973, pp. 27-8.